Lance Hahn is a man who understands fear. His book How to Live in Fear discusses his own personal struggles with fear and the resulting panic attacks that have plagued him for his entire life. He works as a pastor, and in 2014 hit rock bottom with panic, anxiety and fear to the extent that he had to take a leave from his job. After suffering so long himself, Hahn is in a position to be able to analyze and discuss the causes and treatments of fear. 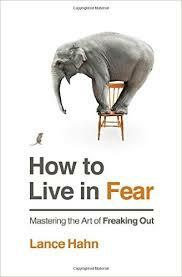 He lists three main parts of fear: root cause, core catalysts and situational triggers. Since the root cause of irrational fear may be a genetic disposition toward the condition, Hahn urges exceedingly fearful people not to be ashamed of their illness. Some of the catalysts that he outlines which might cause fear include childhood trauma, distorted world view, having a "high-functioning mind" (and I'd like to meet someone who doesn't feel their mind is high-functioning!) and being overly sensitive to threats that don't exist. He advises people to try to explore what causes their fears to see if there is a specific time of day or group of people that cause you to be anxious, and attempt to take measures to avoid or anticipate these triggers. The statistics Hahn quotes about the effect of fear on people in the US speak for themselves: nearly 40 million Americans suffer from some sort of anxiety disorder, but most suffer symptoms for over 10 years before seeking help. He gives some possible reactions to stressful situations, and how they can be managed. In the management category, he takes a look at the pros and cons of using medication to manage symptoms. There are also internal (distraction, journaling, counseling, etc.) and external (getting plenty of exercise, rest, pursuing hobbies, etc.) that can be employed to help ward off or minimize symptoms. As a minister, he also devotes a good deal of the book to Biblical examples and remedies which he relies on when fear takes hold.